You and your colleagues can open and work on the same Excel workbook. This is called co-authoring. When you co-author, you can see each other's changes quickly — in a matter of seconds. And with certain versions of Excel, you'll see other people's selections in different colors. If you're using a version of Excel that supports co-authoring, you select Share in the upper-right corner, type email addresses, and then choose a cloud location. But if you need more details, like which versions are supported and where the file can be stored, this article will walk you through the process. To co-author in Excel for Windows desktops, you need to make sure certain things are set up before you start. After that, it just takes about four steps to co-author with other people. You need an Office 365 subscription. You need the latest version of Excel for Office 365 installed. Please note that if you have a work or school account, you might not have a version of Office that supports co-authoring yet. This might be because your administrator hasn’t provided the latest version to install. You need to sign in to Office with your subscription account. You need to use Excel Workbooks in .xlsx, .xlsm, or .xlsb files. If your file isn’t in this format, open the file and then click File > Save As > Browse > Save as type. Change the format to Excel Workbook (*.xlsx). Please note that co-authoring does not support the Strict Open XML Spreadsheet format. Using a web browser, upload or create a new workbook on OneDrive, OneDrive for Business, or a SharePoint Online library. Please note that SharePoint On-Premises sites (sites that are not hosted by Microsoft), do not support co-authoring. If you are not sure which one you are using, ask the person in charge of your site, or your IT department. If you are prompted to choose a version of Excel, click Microsoft Excel. Type email addresses in the Invite people box, and separate each with a semicolon. Make sure to also select Can edit. When you’re done, click the Share button. Note: If you want to send the link yourself, don't click the Share button. Instead, click Get a sharing link at the bottom of the pane. If you clicked the Share button, people will receive an email message inviting them to open the file. They can click the link to open the workbook. A web browser will open, and the workbook will open in Excel Online. If they want to use an Excel app to co-author, they can click Edit Workbook > Edit in Excel. However, they'll need a version of the Excel app that supports co-authoring. Excel for Android, Excel for iOS, Excel Mobile, and Excel for Office 365 subscribers are the versions that currently support co-authoring. If they don't have a supported version, they can click Edit Workbook > Edit in Browser to edit the file. Note: If they're using the latest version of Excel, PowerPoint, or Word there's an easier way: They can click File > Open and select Shared with Me. You might see other people's selections in different colors. This happens if they are using Excel for Office 365 subscribers, Excel Online, Excel for Android, Excel Mobile, or Excel for iOS. If they're using another version you won't see their selections, but their changes will appear as they are working. If you see other people's selections in different colors, they'll show up as blue, purple and so on. However, your selection will always be green. And on other people’s screens, their own selections will be green as well. If you lose track of who’s who, rest your cursor over the selection, and the person’s name will be revealed. If you want to jump to where someone is working, click their picture or initials, and then click the Go to option. In Excel for Office 365 subscribers, you might notice AutoSave in the upper-left corner. AutoSave is enabled when a file is stored on OneDrive, OneDrive for Business, or SharePoint Online. It automatically saves your changes to the cloud as you are working. And, if other people are working on the same file, AutoSave lets them see your changes in just a matter of seconds. For more information on AutoSave, including reasons why it may be available or unavailable, see What is AutoSave? Why am I getting the "File is locked" error? There are a handful of reasons why this error can occur. The most common one is because someone has opened the file with a version of Excel that doesn't support co-authoring. If just one person does this, then everyone else will get the "locked" error — even if everyone else is using a version of Excel that does support co-authoring. * Co-authoring in this version requires the latest version of Excel for Office 365 installed, and requires you to sign in to Office with an Office 365 subscription account. 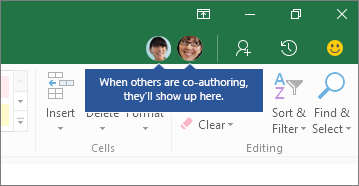 Please note that if you have a work or school account, you might not have a version of Office that supports co-authoring yet. This might be because your administrator hasn’t provided the latest version to install. If you are still getting the "locked" error, see Excel file is locked out for editing for more solutions to this problem. Why can’t I see other people’s selections? You can see other people's selections in different colors, but only if you and other people are using Excel for Office 365 subscribers, Excel Online, Excel for Android, Excel Mobile, or Excel for iOS. In addition, if people are using Excel for Office 365 subscribers, then everyone needs to have AutoSave on to see colored selections. If you are using Excel for Office 365 subscribers, Excel Online, Excel for Android, or Excel for iOS and you don't see other people's selections, then wait a few seconds. If you still don't see someone's selections, make sure they are using Excel for Office 365 subscribers, Excel Online, Excel for Android, or Excel for iOS. If they are using another version, like Excel Mobile, then their selections will not appear to you. However, any changes they make will show up almost instantly. In addition, if they are using an older ﻿version of Excel, like Excel 2013, then they won't be able to edit the file at the same time as you, and therefore you won't be able to see their selections. Why can’t I see other people’s changes? Wait a minute or two. Sometimes it takes some time for Excel and the cloud to communicate with each other. Tell everyone to click the Enable Editing button if it appears. Make sure everyone who is working in Excel for Office 365 subscribers has AutoSave on in the upper-left corner of the Excel window. If you are using OneDrive to sync files, make sure it is not paused, and make sure that Use Office 2016 to sync files... is turned on. Details on this setting can be found here. Make sure those who are working in Excel for Android have AutoSave on. They can turn it on by tapping File > > AutoSave. Make sure those who are working in Excel for iOS have AutoSave on. They can turn it on by tapping File > AutoSave. Make sure the file is not read-only. On a Windows PC, open the file and go to File > Info. Resolve any errors that may be shown there. What can I do about “Refresh recommended” and “Upload failed” messages? This may happen occasionally if someone uses an Excel feature that is not fully supported in Excel co-authoring yet. This can stop the co-authoring process temporarily. If you don’t have any unsaved changes, simply click Refresh. If you have unsaved changes that you don’t need to keep, you can click Discard changes. For stuff that you need to keep, click Save a Copy and save the file as a different name. Then, select and copy the changes you need to keep. Finally, one last step: Reopen the original file that's on the cloud and paste your changes back in. What happens when two people make a change to the same thing? In general, the last change that is saved, either with the Save button or automatically with AutoSave, is the one that “wins.” There are some exceptions to this, but that’s generally how it works. If you don’t want to have conflicts with other people, assign areas or sheets to each person. You can explain these assignments when you send the link out, or you can make the assignments obvious in the workbook itself by putting people’s names in heading cells, or naming sheets with people’s names. Keep in mind that if you are using OneDrive to sync files, changes you make while your computer is offline won't get merged until your computer is online again. And once online, all your changes get merged at once. Can I see previous versions of the file? Yes. In Excel for Office 365, click File > Info > View and restore previous versions. Then find a past version in the list, and then click Open version. The past version will open. If you want to restore it to the current version, wait until everyone is no longer co-authoring, and then click Restore. For more information on versions, see View historical versions of Office files. To co-author in Excel for Mac desktops, you need to make sure certain things are set up before you start. After that, it just takes about four steps to co-author with other people. You need the latest version of Excel for Office 365 installed. Please note that if you have a work or school account, your administrator may control which version of Office you can install, and it may not be the latest version. See When do I get the newest features in Office 365? for more information. You need to use .xlsx, .xlsm, or .xlsb files. If your file isn’t in this format, open the file and then click File > Save As…. Change the file format to .xlsx, .xlsm, or .xlsb. Using your web browser, upload or create a new workbook on OneDrive, OneDrive for Business, or a SharePoint Online library. Please note that SharePoint On-Premises sites (sites that are not hosted by Microsoft), do not support co-authoring. If you are not sure which one you are using, ask the person in charge of your site, or your IT department. Tip: If they're using the latest version of Excel for Office 365 subscribers, there's an easier way: They can click File > Open... > Shared and select a file that has been shared by another person. * Co-authoring in this version requires the latest version of Excel installed, and requires you to sign in to Office with an Office 365 subscription account. Please note that if you have a work or school account, you might not have a version of Office that supports co-authoring yet. This might be because your administrator hasn’t provided the latest version to install. If you are using Excel for Office 365 subscribers, Excel Online, Excel for Android, or Excel for iOS and you don't see other people's selections, then wait a few seconds. If you still don't see someone's selections, make sure they are using Excel for Office 365 subscribers, Excel Online, Excel for Android, or Excel for iOS. If they are using another version, like Excel Mobile, then their selections will not appear to you. However, any changes they make will show up almost instantly. In addition, if they are using an older ﻿version of Excel, like Excel for Mac 2011, then they won't be able to edit the file at the same time as you, and therefore you won't be able to see their selections. Make sure everyone who is working in Excel 365 for Windows or Mac has AutoSave on in the upper-left corner of the Excel window. Yes. Click File > Restore > Browse Version History. Then find a past version in the list, and then click Open Version. The past version will open. If you want to restore it to the current version, wait until everyone is no longer co-authoring, and then click Restore. It takes just four steps to co-author in Excel Online. In the upper-right area, click Share >Share with People. Type email addresses in the first box, and separate each with a semicolon. Make sure to also select Can edit or Recipients can edit. When you’re done, click the Share button. Tip: If you want to send the link yourself, don't click the Share button. Instead, click Get a link on the left. Now you can co-author the workbook at the same time as other people. You know you're co-authoring with one other person if you see a message in the upper-right corner says they are editing. If more than one other person is editing, you'll a different message that tells you the number of people that are co-authoring. For example: "2 other people are here." If you see other people's selections in different colors, they'll show up as blue, purple and so on. However, your selection will always be green. And on other people’s screens, their own selections will be green as well. If you lose track of who’s who, rest your cursor over the selection, and the person’s name will be revealed. You can see other people's selections in different colors, but only if you and other people are using Excel Office 365 subscribers, Excel Online, Excel for Android, Excel Mobile, or Excel for iOS. In addition, if people are using Excel for Office 365 subscribers, then everyone needs to have AutoSave on to see colored selections. Make sure everyone who is working in Excel for Office 365 subscribers has AutoSave on. If someone is using OneDrive to sync files, they need to make sure it is not paused. And, they need the Use Office 2016 to sync files... setting turned on. Details on this setting can be found here. Keep in mind that if someone is using OneDrive to sync files, changes they make while their computer is offline won't get merged until their computer is online again. And once online, all their changes get merged at once. Yes. In Excel Online, go to the folder that contains the file. Then right-click the filename and choose Version history. Then click an older version on the left and that version will open. If you want to restore it to the current version, wait until everyone is no longer co-authoring, and then click Restore. To co-author in Excel Android, you need to make sure certain things are set up before you start. After that, it just takes about four steps to co-author with other people. You need the latest version of Excel installed, and you need to sign in to Excel with a Microsoft account. Go to File > Open and make sure your Microsoft account is listed there. If it isn't, tap Add a place to add the account. Please note that if you have a phone or tablet that's larger than 10.1 inches, you need to sign in with an Office 365 subscription account. You need to use .xlsx, .xlsm, or .xlsb files. If your file isn’t in this format, open the file in a desktop version of Excel. Then tap File > Save As > Browse > Save as type and change the format to .xlsx, .xlsm, or .xlsb. Create or open a file, and then tap File > Save As. Check the current location of the file. If OneDrive or SharePoint are selected, then tap the Back button, and go to the next step. If one of these is not selected, then tap OneDrive or SharePoint on the left, name the file, and then tap Save. Type email addresses in the Invite people box, and separate each with a semicolon. Make sure to also select Can edit. When you’re done, tap the Share button. Tapping this button will send email messages to people for you. Tip: If you want to send the link yourself, don't tap the Share button. Instead, tap Share as link. If you tapped the Share button, people will receive an email message inviting them to open the file. They can click the link to open the workbook. A web browser will open the workbook in Excel Online. They can co-author in Excel Online right away by clicking Edit Workbook > Edit in Browser. If they want to use an Excel app and not Excel Online to co-author, they can click Edit Workbook > Edit in Excel. However, they'll need a version of the Excel app that supports co-authoring. Excel for Android, Excel for iOS, Excel Mobile, and Excel for Office 365 subscribers are the versions that currently support co-authoring. Now you can co-author the workbook at the same time as other people. To see who's editing the file with you, tap Share in the upper-right, and then tap Manage. If there are others working on the file at the same time as you, you'll see their name listed. If they have an Editing label, they're working on the file. This may happen occasionally if someone uses an Excel feature that is not fully supported in Excel co-authoring yet. This can stop the co-authoring process temporarily. If you don’t have any unsaved changes, simply tap Refresh. If you have unsaved changes that you don’t need to keep, you can tap Discard changes. For stuff that you need to keep, tap Save a copy and save the file as a different name. Then, select and copy the changes you need to keep. Finally, one last step: Reopen the original file that's on the cloud and paste your changes back in. Yes. In Excel for Android, tap File > History. Then tap a past version, and it will open. If you want to restore it to the current version, wait until everyone is no longer co-authoring, and then tap Restore this version. To co-author in Excel for iOS, you need to make sure certain things are set up before you start. After that, it just takes about four steps to co-author with other people. You need the latest version of Excel installed, and you need to sign in to Excel with a Microsoft account. When you open Excel, tap Open and make sure your Microsoft account is listed there. If it isn't, tap Add a place to add the account. Please note that if you have a phone or tablet that's larger than 10.1 inches, you need to sign in with an Office 365 subscription account. You need to use .xlsx, .xlsm, or .xlsb files. If your file isn’t in this format, open the file in a desktop version of Excel. Then click File > Save As > Browse > Save as type and change the format to .xlsx, .xlsm, or .xlsb. Co-authoring requires that you save a workbook to OneDrive, OneDrive for Business, or a SharePoint Online library. Please note that SharePoint On-Premises sites (sites that are not hosted by Microsoft), do not support co-authoring. If you are not sure which one you are using, ask the person in charge of your site, or your IT department. Create or open a file. If you created a file, tap File , tap Name, and then name the file. Then choose a OneDrive, OneDrive for Business, or SharePoint Online location on the left and tap Save. If you opened an existing file, tap File > Properties. If the Location path contains the words "OneDrive," "d.docs.live.net", or "SharePoint" then it's likely been saved to one of these locations already. If it doesn't have those words, tap File > Save a Copy and save it to OneDrive, OneDrive for Business, or SharePoint Online. Tap Share in the upper-right. If you want to send the link to the file yourself, tap Copy Link > View and Edit. Then paste the link into an email message or IM window. If you want Excel to send the link for you in an email message, tap Invite People. Then type email addresses in the Invite people box and tap return after each address. Also make sure that Can edit is turned on. Finally, tap Send. If you tapped Send in the previous step, people will receive an email message inviting them to open the file. They can click the link to open the workbook. A web browser will open the workbook in Excel Online. They can co-author in Excel Online right away by clicking Edit Workbook > Edit in Browser. Now you can co-author the workbook at the same time as other people. To see who's editing the file with you, tap Share in the upper-right, and then tap Shared With. If there are others working on the file at the same time as you, you'll see their name listed. If they have an Editing... label, they're working on the file. If you want to restore the file to a past version, wait until everyone is no longer co-authoring. Then tap File > Restore > View Version History Online. A web browser will open with the versions past versions of the file. If you're using OneDrive, tap a version on the left, and then tap Restore. If you're using OneDrive for Business or SharePoint Online, tap a version date and time, tap the down arrow, and then tap Restore. Then go back to Excel for iOS, and reopen the file. To co-author in Excel Mobile, you need to make sure certain things are set up before you start. After that, it just takes about four steps to co-author with other people. You need the latest version of Excel Mobile installed on your tablet or phone, and you need to sign in to Excel with a Microsoft account. Go to File > Settings > Accounts and make sure your Office 365 account is listed there. If it isn't, tap Add account. Please note that if you have a phone or tablet that's larger than 10.1 inches, you need to sign in with an Office 365 subscription account. Create or open a file, and then tap File > Save. Check the current location of the file. Under the filename, check to see if the words OneDrive or SharePoint are in the path of the file. If they are, tap the Back button and go to the next step. If one of these is not included in the path, then tap Save a copy of this file, and then save the file to a OneDrive, OneDrive for Business, or SharePoint Online location. Please note that SharePoint On-Premises sites (sites that are not hosted by Microsoft), do not support co-authoring. If you are not sure which one you are using, ask the person in charge of your site, or your IT department. Tip: If you want to send the link yourself, don't tap the Share button. Instead, tap Get a sharing link at the bottom of the pane. Now you can co-author the workbook at the same time as other people. To see who's editing the file with you, tap Share in the upper-right. If there are others working on the file at the same time as you, you'll see their name listed. If they have an Editing label, they're working on the file. Other people's selections aren't visible in Excel Mobile at this time. The versions that support showing selections are Excel for Office 365 subscribers, Excel Online, Excel for Android, and Excel for iOS. In Excel Mobile, tap File > History. Then tap a past version, and it will open. If you want to restore it to the current version, wait until everyone is no longer co-authoring, and then tap Restore this version.